The RTS20 is often used with a 72” diameter blade. This rock saw is one of the most versatile units being used to saw concrete runways, asphalt road works and primary saw cut in quarries. The RTS20 rock saw applications also include saw cutting frost. The model rock saw can be found on job sites and quarries often used to primary cut sandstone and line stone. 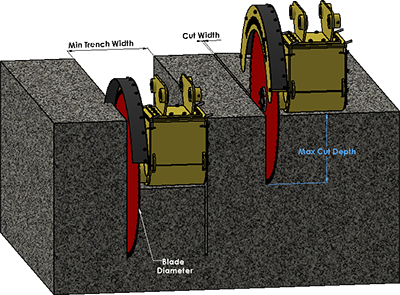 The rock saw when fitted with a wide blade can be used for cable laying applications. Used with 10-20 ton excavators.